A cross-sectional view showing skin tone becoming darker due to the production of more melanin to overcome DNA damage caused by UV radiation. Credit: Wikimedia Commons. Skin cancer is by far the most common form of cancer, affecting more than 1 million people a year in the United States. One in five Americans will develop skin cancer by the age of 70, according to the Skin Care Foundation. Skin cancer forms most commonly on skin that’s been exposed to the ultraviolet (UV) radiation. But about 9 our of 10 cases of melanoma — the deadliest type of cancer — can be prevented by using proper protection when outside in the sun. Ultraviolet (UV) designates a band of the electromagnetic spectrum with wavelengths ranging from 10 nm to 400 nm, shorter than that of visible light but longer than X-rays. Our senses cannot detect UV rays — not until the damage is done — which is why they can be especially dangerous. Too much time in the sun causes sunburns, eye damage, accelerate aging, and skin cancer. UVB is responsible for the majority of sunburns. UVA penetrates deep into the skin. It ages the skin, but contributes much less towards sunburn. There’s a third type of UV ray, UVC, which is the most dangerous of all. Luckily, it is completely blocked by the ozone layer. There are several types of skin cancers, including squamous cell skin cancer, which is found in the flat cells on the top of the skin, and basal cell skin cancer, which is found in the round cells deeper inside skin’s outer layer. Melanoma is the deadliest type of skin cancer. It affects all skin colors, although melanoma is more than 20 times more common in whites than in African Americans. According to the American Cancer Society’s Cancer Statistics Center, the lifetime risk of getting melanoma is about 2.6% (1 in 38) for whites, 0.1% (1 in 1,000) for blacks, and 0.58% (1 in 172) for Hispanics. 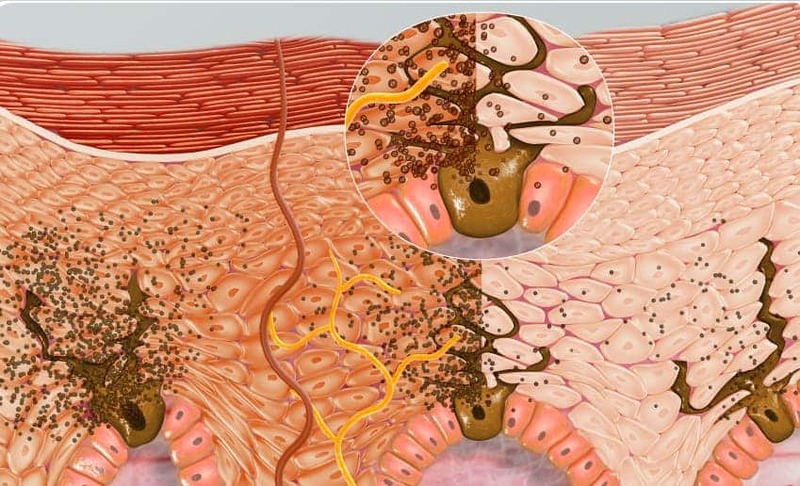 Melanoma frequently develops in a mole or suddenly appears as a new dark spot on the skin. Research suggests that this cancer occurs when the DNA in melanocytes, the cells that make the melanin (the pigment responsible for determining skin and hair color), get damaged by UV light due to exposure to the sun or tanning beds. 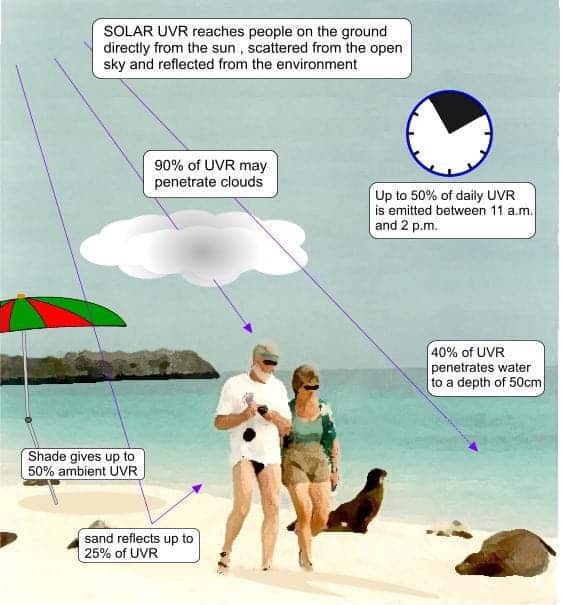 Some quick facts about UV exposure. Image: Australian Radiation Protection and Nuclear Safety Agency. A 2017 study led by researchers at the Yale School of Medical — which exposed both human and mouse melanocyte cells to harmful radiation via a UV lamp — found that UV radiation caused a type of DNA damage known as a cyclobutane dimer (CPD). In this genetic alteration, two DNA “letters” attach and bend the DNA material, preventing the information it contains from being read correctly. What was truly surprising was that the melanocytes not only generated CPDs immediately but continued to do so hours after UV exposure ended. In other words: melanin has both carcinogenic and protective effects. What’s more, it seems like much of the damage inflicted to the skin by harmful UV light occurs hours after exposure to the sun, when you’re sitting comfortably asleep in your dark bedroom. Your body has ways of repairing most of the damage. But it is not perfect – some damaged DNA can be left behind. It is when the body attempts to repair this damage that we feel the painful symptoms of sunburn. And each time we suffer a sunburn, the next one makes us more vulnerable to skin cancer. According to the National Cancer Institute, the rate of new melanoma cases among American adults has tripled since the 1970s, from 7.89 per 100,000 population in 1975 to 22.7 in 2010. 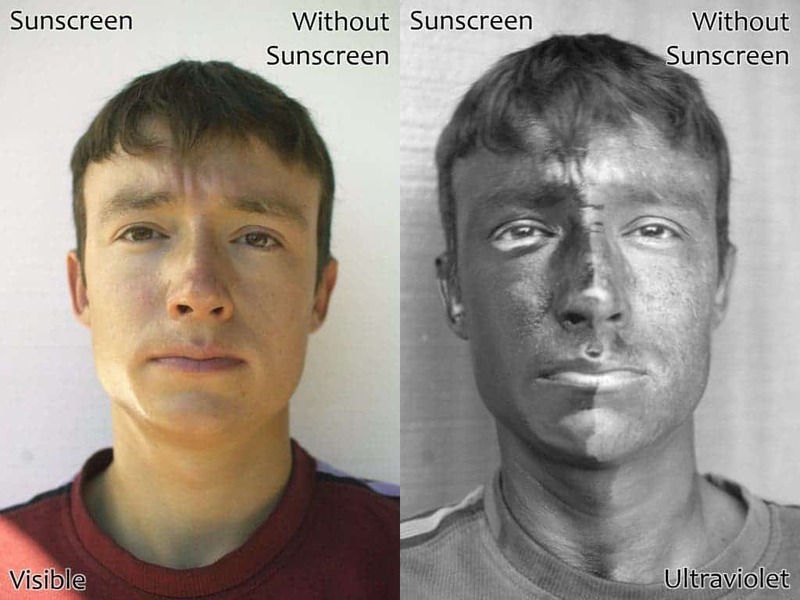 Before and after sunscreen, as seen by a UV camera, demonstrating its protective effects. Image: Wikimedia Commons. Wrap on sunglasses to protect the eyes and skin around them. The UV radiation is particularly intense between 10 AM and 4 PM, so try not to stay outdoors in direct sunlight for too long during this time frame. Counter-intuitively, UV rays become more intense during the spring, long before temperatures get warmer. Also, you shouldn’t neglect protection during the winter when UV radiation can bounce off snow, increasing the amount of radiation you receive. UV rays can easily penetrate water so if you spend time swimming, you’re just as exposed as outside on the beach. Concerning clothing, dark colors generally provide more protection than light colors, although you’ll feel warmer in these (remember UV radiation can’t be felt as heat). A tightly woven fabric protects better than loosely woven clothing and a dry fabric is generally more protective than wet fabric. Considerable attention should be given to sunscreen, which is your best ally in the face of the sun’s damaging rays. It’s important to learn not only how to select the right sunscreen but also how to properly apply it. In order to signal the level of protection, manufacturers have introduced the SPF rating, which is also the source of much confusion. Basically, the SPF rating indicates how many times a person’s UVB exposure will be reduced once the sunscreen is applied. For instance, if it would take 15 minutes in the sun for your skin to get burned, wearing SPF 15 will extend the window 15 times, meaning it now takes three hours and 45 minutes for your skin to feel the same effect. A sunscreen with an SPF 100 index means the same person would be protected for more than 24 hours. The formula below explains how the SPF index works. For years, SPF 30 protection seemed like more than enough to prevent surface sunburns. Today, there are companies that sell sunscreen labeled with SPF 50, 70 and even 100. However, the improvements are only marginal. For each minute wearing an SPF 30 sunscreen lotion, you receive a 1/30th (3.33%) of the UV exposure that you’d get without the lotion. This means SPF 30 protects you from 97% of UVB rays. SPF 80 blocks only another 1.75% of UVB radiation, while SPF 100 blocks 99% of UVB rays. So the difference between SPF 30 and SPF 100 is only 2.3%. What’s more important than the SPF rating is properly applying the sunscreen — something which most people don’t know how to do. On average, people are only getting 40% of the SPF protection offered by correct dosing of the product. According to a recent study by researchers at King’s College London, you should apply around 2 mg of sunscreen per centimeter squared to reap all the protective benefits. That’s about twice as much people typically apply to their skin. To get an idea just how important sunscreen is, the study found that five days of exposure to high-intensity UV rays when sunscreen was applied in the correct amount were less damaging that one day of low UV exposure without sunscreen on, the researchers reported in the journal Acta Dermato-Venereologica. The takeaway is simple: never forget to use sunscreen when you’re at the beach and make sure to apply the right amount while you’re at it. When in doubt, put on much more than you usually do.